Could the ice spheres be made without connecting the mold? It seems you could make half spheres so they wouldn’t go above the glass edge. And if flat on the bottom, there’d be no clinking. If not possible, too bad. Cool glasses though. Nice finds! I always find IKEA to be overwhelming so it’s nice to have some specific items to keep an eye out for. What do you think, do you like Bar del Corso? We went once, loved the meatballs as an appetizer but thought the pizza tasted too burnt. Have been meaning to go back for the fried(?) cauliflower. Denise – That is a very smart idea! The king sized ice cubes don’t leave much room for anything more than a decent pour of bourbon, a half sphere ice cube might work really nicely in this case. Charissa – I’ve only had the pizza once and I don’t remember there being anything wrong with it. On three separate occasions we’ve gone in and just ordered appetizers and sides, and yes the cauliflower was really delicious. When we went it was romanesco cauliflower and it was sauteed. We’ve had the meatballs to and some arancini (which might have been a special) which were amazing. We order sides there because, as you know, we live in such a woodfired pizza-dense part of the city that we have actually found ourselves sort of tired of pizza. Which, heh, suuuch a terrible problem to have. Espiral Rosè! My lifeblood!! 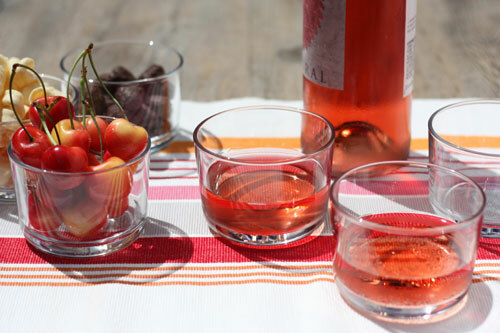 I also prefer drinking my wine out of non-wine glasses, and I love that headcount double as cute serving dishes! Alison – I picked it up at Trader Joes and it’s lovely. I’ll have to add it to my list of things to grab when I trek out to a TJs. I’ll need to get some of the large bowls. We bought Uwajimaya blue koi bowls for pho but we eat giant salads for lunch out of big metal mixing bowls currently, which is less than ideal. Courtney – The Uwajimaya near me didn’t have any big bowls, I looked there first! I’ve eaten salad out of these many times now and it’s like a luxury salad, like I’m at a fancy restaurant and they want my salad experience to be as memorable as a thick steak. A womb of nourishing salad, if you will. Also, the large bowls work especially nicely if you’re likely to be eating said salad while watching tv (as we can be found most dinner times), you’re much less likely to drop leaves onto the couch. Ha, hahah. 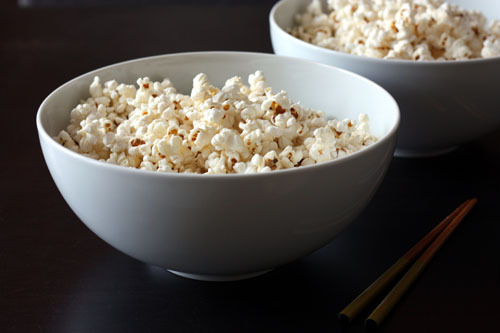 I use chopsticks to eat popcorn because nothing makes me crazier than greasy fingers, but now that I think about it, my chopstick skills are pretty legit because of it. Good luck with your training!